What form or type of essay does the Cincinnati or UCLA essay prompt require? What are the keywords present that help identify the required essay format? Is it a personal interests essay? What details or information do you need to provide to complete this task? Can you just use personal experiences? Do you need thorough research? What arguments are suggested in the University of Cincinnati essay question? Can you make a convincing stand on the issue? Can you prove to the readers that you truly understand the question? 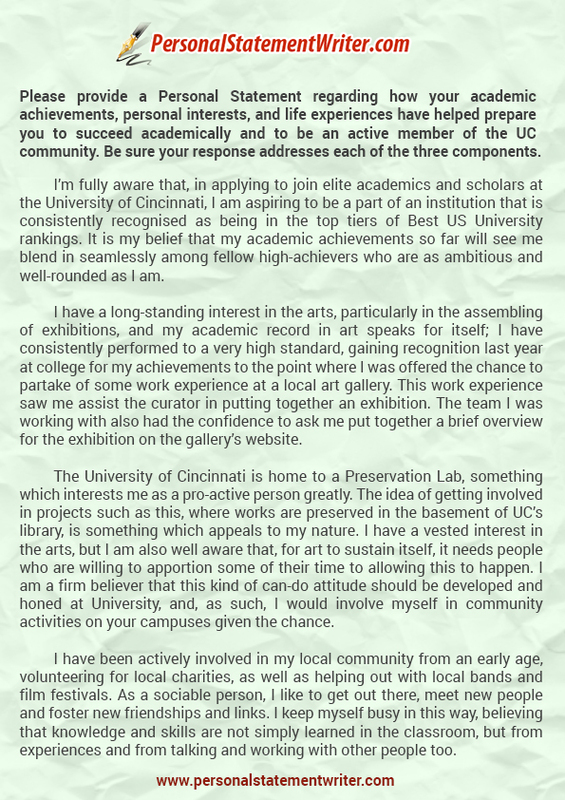 Please provide a personal statement regarding how your academic achievements, personal interests, and life experiences have helped prepare you to succeed academically and to be an active member of the UC community. Be sure your response addresses each of the three components. I’m fully aware that, in applying to join elite academics and scholars at the University of Cincinnati, I am aspiring to be a part of an institution that is consistently recognized as being in the top tiers of Best US University rankings. It is my belief that my academic achievements so far will see me blend in seamlessly among fellow high-achievers who are as ambitious and well-rounded as I am. I have a long-standing interest in the arts, particularly in the assembling of exhibitions, and my academic record in art speaks for itself; I have consistently performed to a very high standard, gaining recognition last year at college for my achievements to the point where I was offered the chance to partake of some work experience at a local art gallery. This work experience saw me assist the curator in putting together an exhibition. The team I was working with also had the confidence to ask me to put together a brief overview of the exhibition on the gallery’s website. The University of Cincinnati is home to a Preservation Lab, something which interests me as a pro-active person greatly. The idea of getting involved in projects such as this, where works are preserved in the basement of UC’s library, is something which appeals to my nature. I have a vested interest in the arts, but I am also well aware that, for art to sustain itself, it needs people who are willing to apportion some of their time to allow this to happen. I am a firm believer that this kind of can-do attitude should be developed and honed at University, and, as such, I would involve myself in community activities on your campuses given the chance. I have been actively involved in my local community from an early age, volunteering for local charities, as well as helping out with local bands and film festivals. As a sociable person, I like to get out there, meet new people and foster new friendships and links. I keep myself busy in this way, believing that knowledge and skills are not simply learned in the classroom, but from experiences and from talking and working with other people too. Read the entire University of Cincinnati college application essay prompt. Do not be in a rush but read the question several times. This will help shape your own perspective while you know more about the question. Explain thoroughly but carefully. It is not a matter of how many examples you can produce but how you can effectively use these examples. Present an idea or a point of view supported with examples so you can fully expound the topic. Aim to have 2 to 3 main ideas with well-developed examples. What is wrong with “I?” The first person point of view may not work well in answering different prompts. This is often reserved for questions that require a description or narration of experiences or events. Be yourself. Show that you have a good command of the language and a clear idea of who you really are. This is your chance to talk about an event or experience relevant to your life. Check our guide on how to close a personal statement. 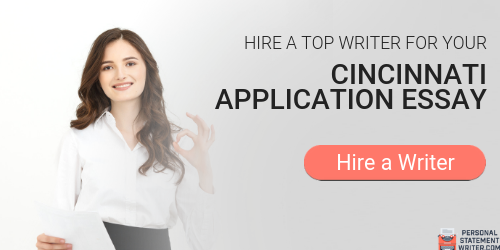 Instead of a painful experience, expert and efficient writers can help with your University of Cincinnati application essay. 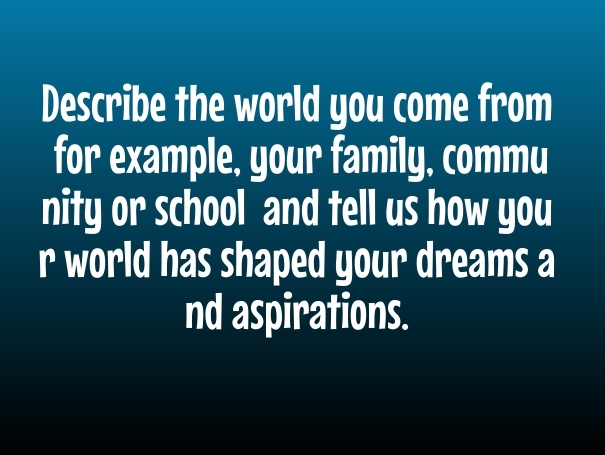 You can provide them with your input or a list of experiences that you want to be included. No more need for you to check the grammar and formatting for they are the ones who will do that. They will research for you and have the essay in the formatting specified by the university admissions (i.e. by UCLA essay prompt admission requirements). 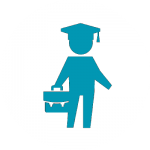 Build a strong University of Cincinnati admission essay with the experts and have more chances of a winning application! Contact us today and we’ll show how your University of Cincinnati essay prompt should be written!